A door is one of the central focuses on the front of a house. It provides the opportunity to add some color and style with paint and accessories. Old, rustic doors look appropriate on older country homes. To achieve this look, you can either wait for nature to take its toll over the course of many years or you can create your own faux rustic door with paint, simple tools and some suitable embellishments. Chipping paint and a simple wreath convey rustic charm. Choose a paint color form a palette of historic colors. These colors contain a hint of neutral pigment, making them look less bright and new. Choose a finish with only a little bit of sheen, like eggshell or satin. Consider using a milk paint, which dries to a durable, matte finish. Apply the paint using a brush with stiff bristles. This will leave more texture and visible brushstrokes. Exaggerate the texture of the grain of wood on your door by painting in the same direction. Allow the paint to dry. Distress the surface by sanding the door with steel wool or sandpaper. Follow natural patterns of wear and tear. Sand off paint around raised trim and the edges of the door panels. Continue removing paint until you have antiqued the doors to the desired degree. Hit the door with a hammer to create dents, for an optional, highly distressed effect. 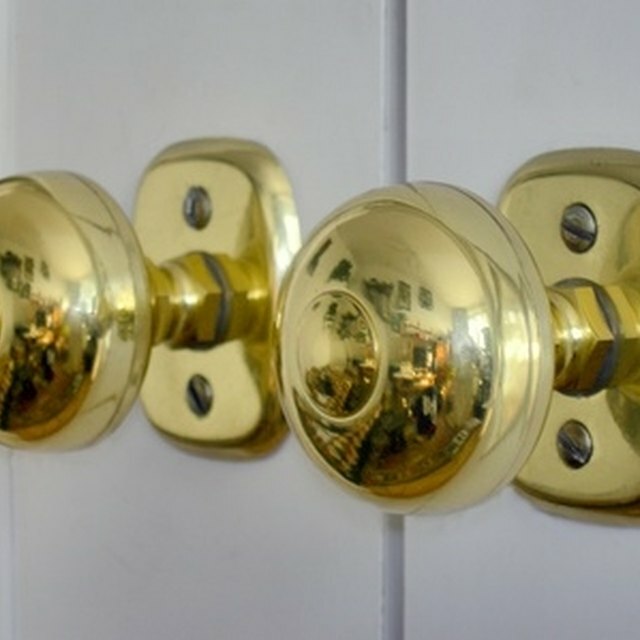 Change the hardware on your door. Choose heavy, old-fashioned reproduction pieces to achieve both function and style. Dark wrought iron is an appropriate choice for a rustic door. Select an appropriate item to hang on your door as decoration. A wreath made from evergreen clippings or other natural materials adds a seasonal touch. Alternatively, hanging a primitive sculpture made from wood or old tools is another option. Buy folk art objects at rural antique stores or make your own from old or discarded objects.